First, ensure you have a GitHub account. To leave a comment on the page, navigate to the bottom of the page. You have several choices. 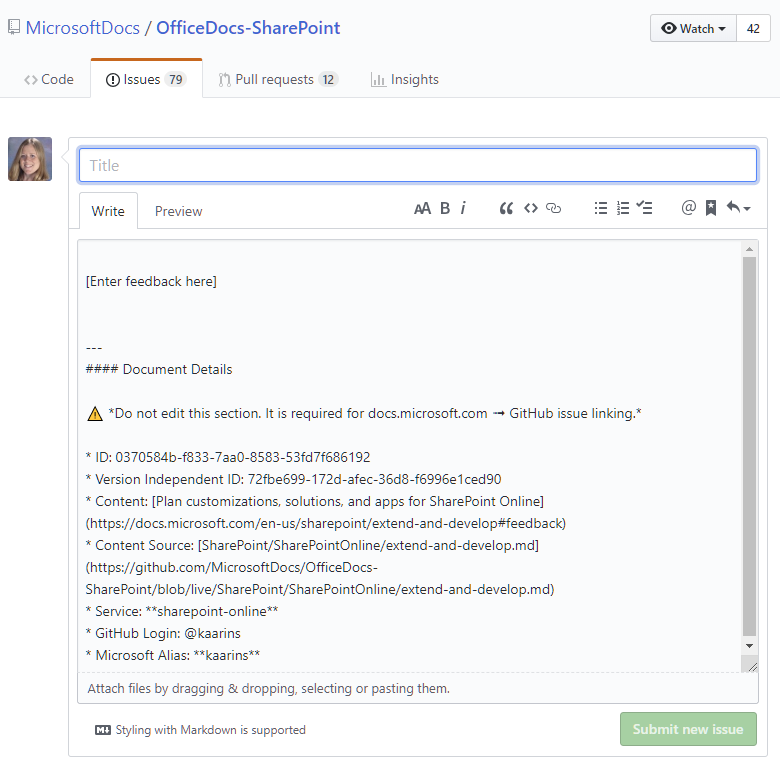 You can either provide feedback on the product as a whole (such as SharePoint Online) or you can leave feedback on the page. 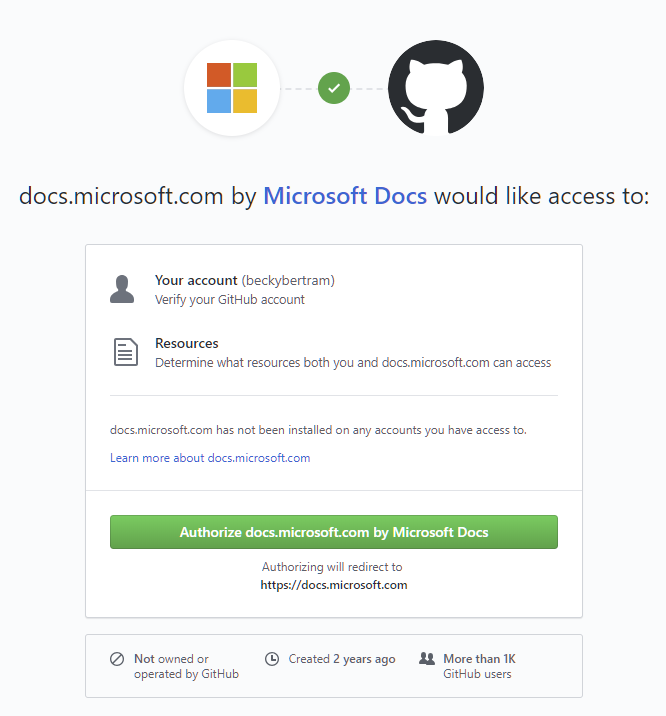 Note that if you click the button that you want to provide feedback on the page, you will get a screen that will ask you if you authorize a connection between GitHub and Microsoft.com. 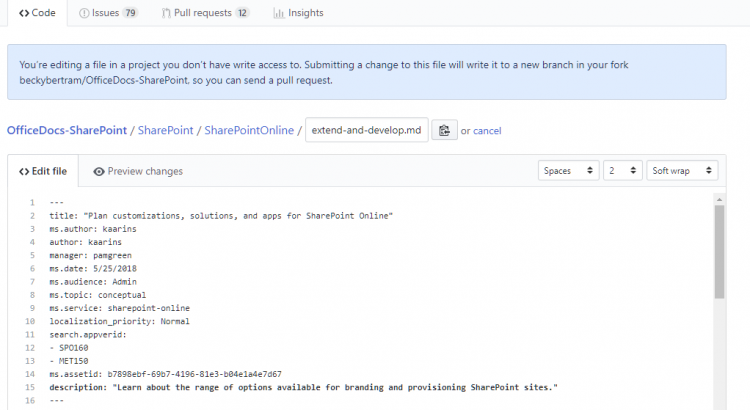 Once you authorize access, if you click the button again, you will now see a form embedded in the Microsoft page. You can use the form to submit your feedback. 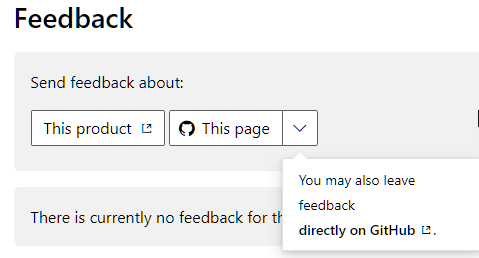 Note that if you are comfortable with GitHub, you have the option of submitting your feedback right on the GitHub site. 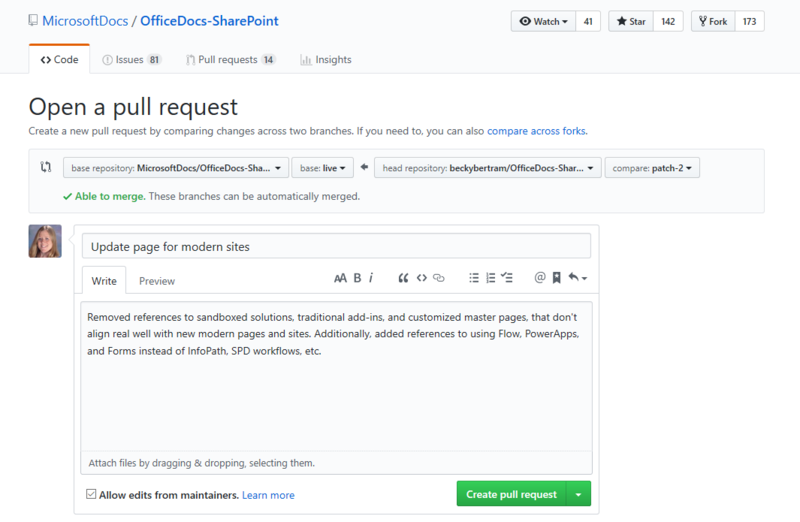 Click on the “directly on GitHub” link in the drop down menu will take you right to a page in GitHub where you can add your comments. If you want to do more than suggest changes, but you feel up to the challenge of actually submitting a change, you can do so. Notice the Edit button at the top right of the page you want to edit. Click the button. This will open the page in GitHub. Go ahead and click on the pencil icon at the top right. A message at the top lets you know that it will create a branch in your own fork since you don’t have edit access in the live repository. After you have made your changes, navigate to the bottom of the page and submit a summary of your changes and click on the “Propose file change” button. This will take you to a page where you can see the changes that have been made. At this point, you can click the “Create pull request” button. 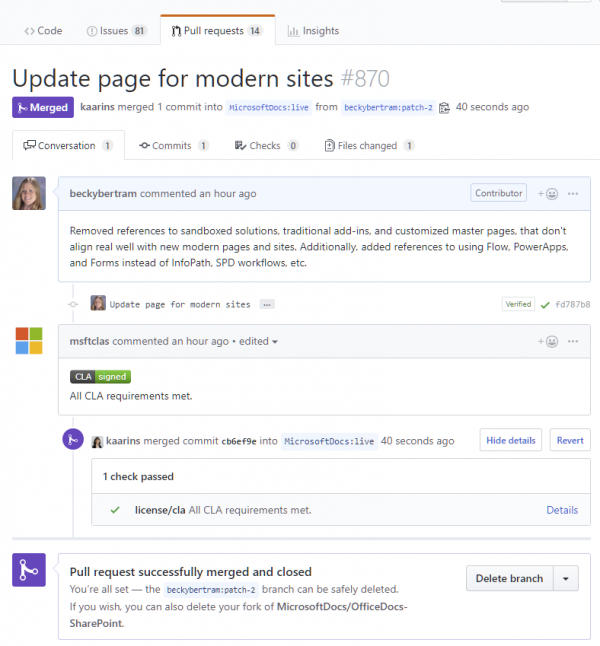 A pull request simply alerts the owners of the repository (at Microsoft) that a change has been made for them to review. It’s up to them to decide how to merge your changes into the live branch. This will present you with a larger box where you can enter your pull request details. 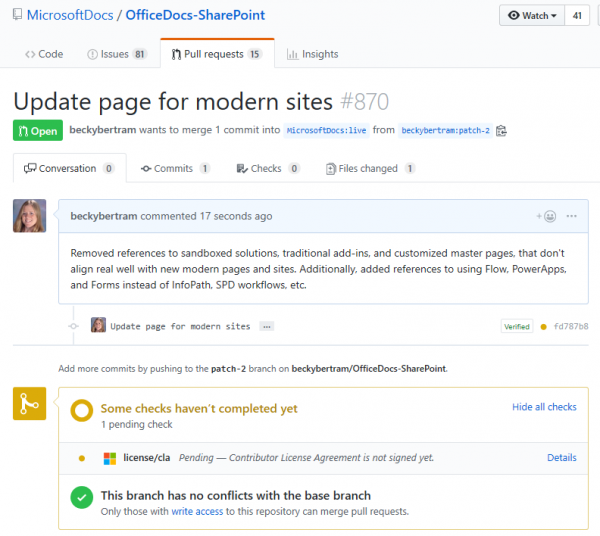 You don’t really need to change anything here other than ensuring that the “Allow edits from maintainers” is checked so Microsoft folks can edit your edits as necesary. 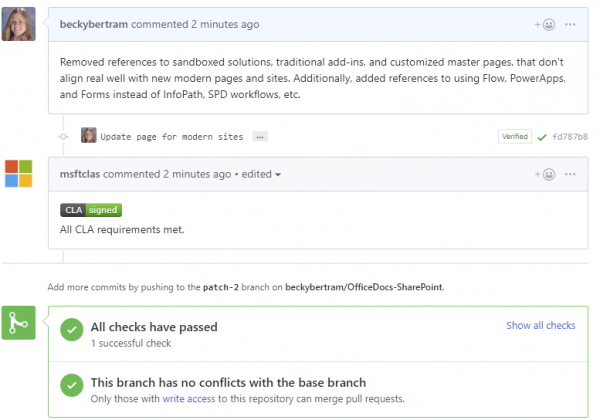 Once again, click the “Create pull request” button. You will now be moved to the “Conversation” tab. If you have not yet signed the contributor agreement, you will see a message letting you know your submission isn’t complete. 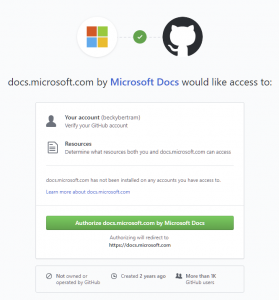 At this point you will get an e-mail asking you to accept the Microsoft Contributions License Agreement. You will now see your conversation thread has been updated to indicate at the “all systems are go”. And if you go to the Files Changed tab, you will see a message that says that you have an open pull request and a message that says something like “<your fork> wants to merge 1 commit into MicrosftDocs:live from <your fork: your branch>”. When your change is approved the Microsoft folks will merge your changes into the live fork and you will see a message that tells you your pull request was successful and your changes were merged. And after that, you get your 15 minutes of fame! 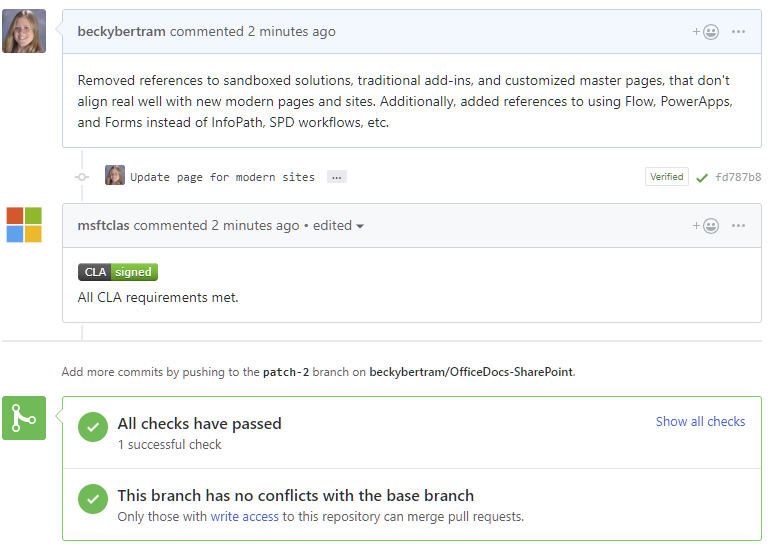 Go to GitHub logged in as your GitHub account, edit the file, click Create Pull Request (both times). Let me know if you were able to pull this off by leaving me a comment. Thanks so much for stopping by my desk while you were in town and listening to my pitch on contributing to docs! I love that you’ve already got your first pull request in so soon. 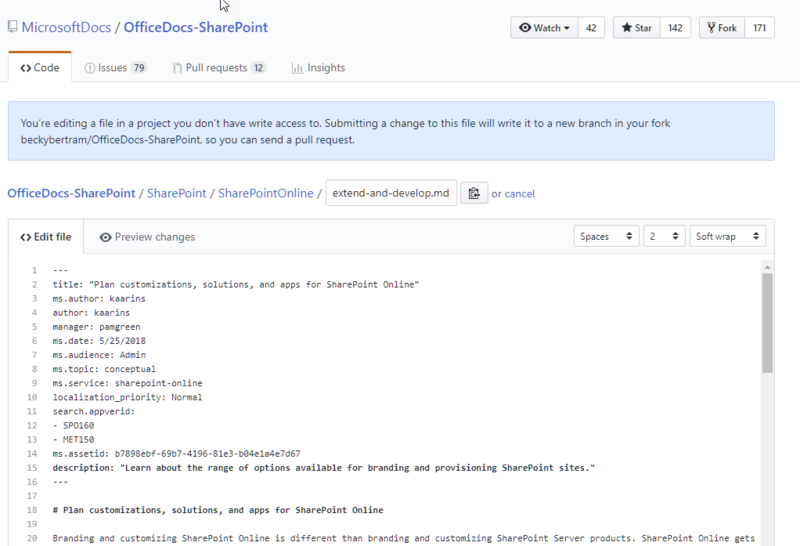 One thing I didn’t mention is that a lot of contributors are using an extension for Visual Studio code to work on the markdown. 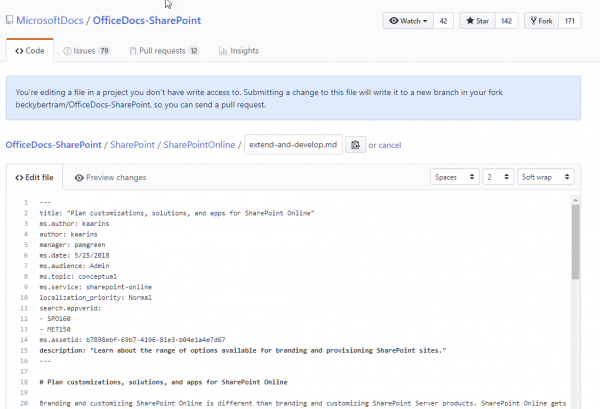 The Docs authoring pack includes a spellchecker, markdown validation and a previewer, so you can see how the file will render on the site. Not quite the same as Word, but a good alternative when you start to become more familiar with markdown.